This is the third part of the International Box Office Correlations series. And it is worth the read, because this time we go beyond the scope of Hollywood, and plant the seeds for world peace, as well as explain geo-political turmoil! In the first part, we looked at grosses in the US vs. the rest of the world combined. In the second part, we looked at the US vs. every country separately. 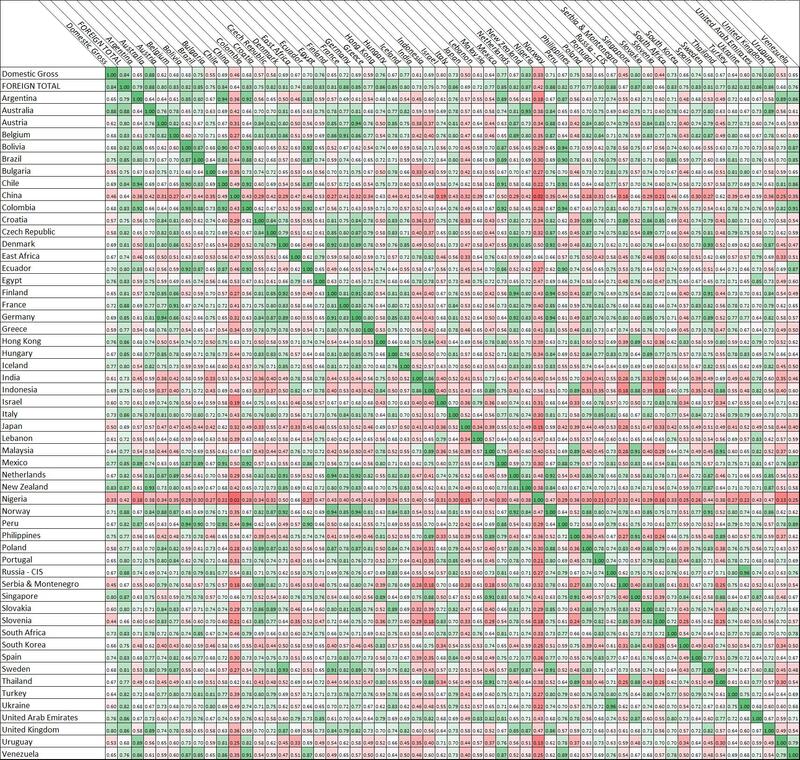 This time, we look at every country vs. every country, in what has turned out to be a giant colorful correlations-matrix that looks like a square Caprese salad. (The image is pretty heavy, so give it a fews seconds. It is followed by two half-matrices, so you can actually read the numbers). Just pick a country on the vertical list and cross it with another one on the horizontal list. Darker green means a stronger correlation between the two countries. Darker red is a weaker correlation. White is somewhere in the middle. 1. China, Nigeria and Japan are red all across. This means they are very individualistic in their acceptance of American films (be it due to local taste, language, local cinematic product, economics, distribution deals, politics, regulation, etc.). These three countries are not only different than the US – they are different than every other country – and that is not trivial. 2. Other “red” countries are India, Indonesia, South Korea, Uruguay, Thailand and Malaysia. But at least they have a few green cells in their arrays. 3. However, as opposed to the examples of Nigeria-China or China-Japan’s low correlations, in the case of India and Indonesia, they actually have a very high correlation between themselves, which means they probably share the same reasons for being so different from the rest of the world. Other examples of countries that probably share similar factors are: South Korea, Indonesia and Malaysia (red across the board, except among themselves). 5. Speaking of world peace: Lebanon’s second highest correlation is with Israel (0.79). Perhaps this will spark peace in the Middle East. The Netherlands and Germany are also closer than their soccer fans would like to admit (0.92). Turkey and Greece are as well (0.76) – don’t forget to thank HollyQuant when Cyprus is soon united. 6. In light of the recent events in Kiev, this seems relevant: the highest value in the matrix is Russia-Ukraine: 0.96. That is an extremely high value, even if the connection is obvious. This should probably trouble the pro-west protesters as it shows Russia’s control over the country through the CIS economic agreements. And all kidding aside, the recent cost of human life in the Ukraine is a real tragedy and I don’t really mean for this post to be anything more than just one more humble perspective on that matter. Even though this high correlation may be manipulated into supporting the claim that the Ukraine should remain a de-facto Soviet Russian entity, I believe that in this case, the number is not rooted in cultural similarities, but rather serves to prove the Russian economic stranglehold over the Ukraine – a stranglehold that is finally being cracked by revolution and bloodshed. 7. Other high correlation clusters can be spotted between the South American countries (e.g. Argentina-Chile (0.94), Argentina-Colombia (0.92), Bolivia-Peru (0.94), Colombia-Bolivia (0.93), Bolivia-Ecuador (0.93), to name a few); the Northern-European cluster (e.g. Finland-Denmark (0.92), Germany-Finland (0.91), Netherlands-Denmark (0.91), Netherlands-Germany (0.92), Norway-Denmark (0.92), Norway-Germany (0.94), Norway-Netherlands (0.92), Sweden-Finland (0.91), etc. ); other European pairs (such as Belgium-France (0.91) Austria-Germany (0.94), Russia-Ukraine (0.96) and others); an East-Asian cluster (Singapore-Malaysia (0.91), Philippines-Singapore (0.91), Thailand-Malaysia (0.91); a weaker English-speaking commonwealth cluster that includes Australia, New-Zealand, the UK and South Africa. 8. Another important observation is that all numeric values are positive. This means that while some of the countries are extremely weakly correlated with others, none of them are negatively correlated (+1 means perfect correlation; -1 means perfect opposite correlation; zero means no correlation at all). This makes sense but is interesting nevertheless: none of the countries have an opposite behavior than any one of the other countries, when it comes to American movies. 9. Have more observations? Notice any surprisingly non-green pairs? Or non-red pairs? Please share! A python script was used to collect domestic and foreign box office data for every country available on boxofficemojo.com – for the top 100 domestic films in 2011, 2012 and 2013 (300 films total). 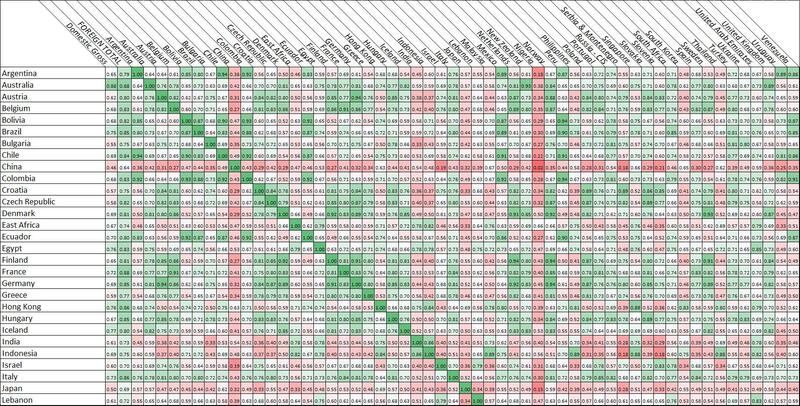 The table here is the correlations matrix of all those countries, based on the 300 film titles. A higher number means a stronger correlation. Theoretically, the numbers can be anywhere between -1 and +1 (-1 means perfect opposite correlation; +1 means perfect correlation; zero means no correlation at all). However, all the values in this table happen to be positive. « 32. ARE MOVIES REALLY GETTING LONGER?